↑ "NĀDER SHAH – Encyclopaedia Iranica". http://www.iranicaonline.org/articles/nader-shah. ↑ "HISTORIOGRAPHY vii. AFSHARID AND ZAND PERIODS – Encyclopaedia Iranica". 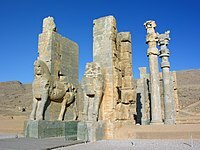 http://www.iranicaonline.org/articles/historiography-vii. "Afsharid and Zand court histories largely followed Safavid models in their structure and language, but departed from long-established historiographical conventions in small but meaningful ways." ↑ Axworthy, Michael (2006). The Sword of Persia. I.B. Tauris, 5, 45, 70, 80, 157, 279. ISBN 1-84511-982-7. ↑ Stokes, Jamie (2010). Encyclopedia of the Peoples of Africa and the Middle East. Infobase, 11.